Recently Heavenly Springs commemorated the Reformation with a special series called, “Women of the Reformation”. Lord willing, we will do this every year. In this series, we featured several prominent yet lesser known women of the Reformation, many of whom published tracts, letters, hymnals and other forms of literature. Among them was Katherina Zell, wife of Strasburg Reformer and pastor, Matthew Zell. Going forward, I would like to share some of her writings for the purpose of building up the church. Katharina has left us a shining example and through her faith, though she is dead, she speaks still (Heb. 11:4). Katherina Zell was known, among other things, for her encouragement to the wives of pastors who suffered persecution. She lived in an age of great upheaval and violence for the saints of God. It was a time when a profession of faith in Christ alone, in many places, meant losing your life. Once, in a neighboring town called Kentzingen a minister was forced to leave. One hundred and fifty men of the parish accompanied him for several miles but when they returned to the town, the gates had been shut. One minister was caught and executed while the rest fled to Strasburg. Moved with compassion for their plight, Katharina not only provided beds and meals for most of the men, she also published a tract for the wives left behind called, “Letter to the Suffering Women Of The Community Of Kentzingen, Who Believe In Christ, Sisters With Me In Jesus Christ (1524).” Below is an excerpt that not only provides a glimpse into the hardships these women faced, but also reveals the firm faith of this Reformation stalwart — not to mention the breadth of her knowledge of Scripture. I think you will agree, her consolation is a far cry from the kind of mollycoddling that many pulpits offer their parishioners today. So I beg you, loyal believing women, also to do this: take on you the manly, Abraham-like courage while you too are in distress and while you are abused with all kinds of insult and suffering. When you may meet with imprisonment in towers, chains, drowning, banishment, and such like things; when your husband and you yourselves may be killed, meditate then on strong Abraham, father of us all [cf. Rm 4:16]; struggle after him as a good child should follow his father in the faith like the father’s. Do you not think that Abraham also suffered when God told him to kill his only son?! When He told Abraham to do it himself! – to kill the son in whom also the blessing of human beings was promised. Yes, indeed he was very grieved, for he was also flesh and blood like all of us; but he knew (as the scripture says) that God could bring his son back to life [cf. Gn 22:1-2; Heb 11:17-19]. As so you also, when your husbands are killed, do you not know that Christ said, “I am the resurrection and the life, whoever believes in me, though he is already dead, yet he will live” (Jn 11:25). And in the sixth chapter of John, He says that whoever eats His flesh and drinks His blood, that is, whoever truly believes that he is redeemed only through the death and shedding of blood of the Christ, that one He will bring back to life on the last day [cf. Jn 6:54]. He says to His disciples, “If you know this, you are blessed” (Jn 13:17). So also to you, believing women beloved by God, Christ says, “Whoever does not want to leave father and mother, wife, husband, and child, and all that he has, for my sake and the Gospel’s, that one is not worthy of me. Whoever, however, for my sake leaves father and mother, wife, husband, and child, farm and field, to that one I will return them a hundredfold here and in the age to come eternal life ” [cf. Mt 10:37, 19:29; Lk 14:26]. 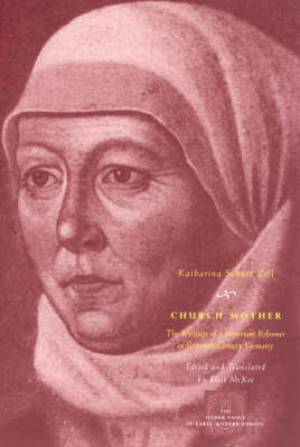 Katharina Schutz Zell, Church Mother: The Writings of a Protestant Reformer in Sixteenth-Century Germany. Edited and Translated by Elsi McKee, The University of Chicago Press, Chicago, 2006, pages 77-78. Wow! What strengthening words in the face of persecution for the sake of Christ. Katherina was definitely not a wimpy, high-maintenance, fragile woman. I think we could use some of her spiritual backbone today. Wow! the strength that God has poured out on this soul to encourage others. Thank you for sharing this! Blessings, my friend!